October is National Bullying Prevention Month. A great time to educate yourself, empower yourself, think about how to handle future bully problems in your own children's lives. 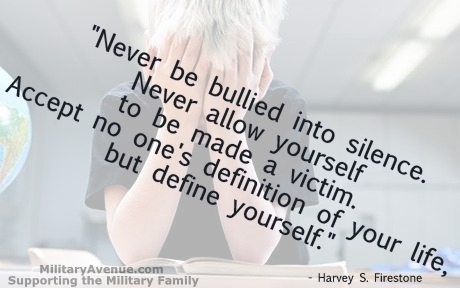 Stopbullying.gov is a great resource, as is StompOutBullying.org. I've written about my own experience with bullying once before and I stand by my thoughts, "Bullying and our Military Children". A normal first assumption is why would Dad be upset with the school for punishing his son, the bully? Why would his dad be upset that his own kid was throwing punches, kicking and screaming and picking on the 'little kid'. I find it sickingly sad that our kids can't stand up for themselves anymore. The pacifist in me wants to ask did Max talk to his teachers, other trusted adults, did his parents go to bat for him before the incident? Yet, the mother in me is enraged that it wasn't caught and Max had to take it to that level, he felt the need to get physical and for that he was punished. He decided to stand up for himself, do something about it and he was punished. Look around you. Do your kids know what they should do if they are being bullied? Do you talk enough that they would be comfortable coming to you? Would you go to bat for them? This dad is doing the right thing, I think. I'm sorry, Max, that it had to come to this. I'm sorry no one stepped in earlier or you weren't sure what to do yourself. For my own boys I hope you aren't ever in this situation. But know that if there is ever a bully who needs a good punch in the nose and by chance you get in trouble for it; we'll go to bat for you, 100%! There's nothing worse than being bullied.